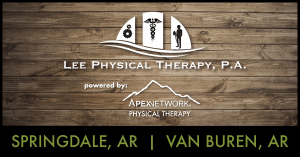 Lee Physical Therapy of Springdale, AR and Van Buren, AR has partnered with ApexNetwork Physical Therapy, an award winning outpatient rehabilitation provider with over 60 clinics nationwide. Both clinics will now accept Medicare and most major commercial insurance. ApexNetwork Physical Therapy strives to provide the highest quality physical therapy; assisting people of all ages and occupations to achieve their goals, perform at their highest level, and excel in health. The Springdale and Van Buren clinics will now offer full spectrum of services including physical therapy, sports rehabilitation, industrial rehabilitation and manual therapy specializing in workers compensation. If you are a patient, employer, physician, case manager, or insurance company, ApexNetwork invites you to stop by for a visit. For more information or to schedule an appointment at either location please reference the following or visit www.apexnetworkpt.com. Why do I have pain? Is the way you are sitting causing your back pain? What should you know about ankle sprains?